Built in 2002, Ak-Chin Southern Dunes Golf Club is a Fred Couples and Schmidt-Curley designed golf course that is one of the best layouts in the state. 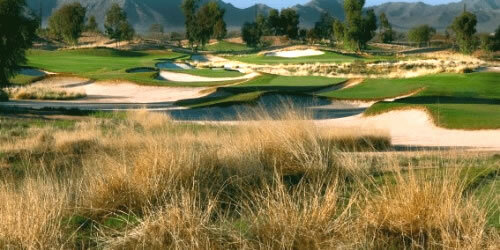 The course is located in Maricopa, Arizona which is about a 45 minute drive from Scottsdale. This Troon managed golf course ranges from 5100 yards to over 7500 from the tips and can accommodate all levels of play. The course features deep Australian style bunkers and small target greens that will challenge the best of golfers. Southern Dunes has also been recently renovated with over 2 million dollars in improvements to the course.